WOW! It has been 11 WEEKS! I can’t believe it! This week I started something new— working out! I decided not to workout at a gym or with a trainer. Nothing HUGE. I decided to take baby steps since it has been years since I was physically active! So I started with workout DVDs. One was geared for moms – New Mommy Makeover (see review and giveaway here) and one was a dancing dvd. I alternated days with these 2 DVDS. Then I also started walking. I walked 30 minutes each day with my kids. This was not only great exercise but it was alot of fun for me and the kids! I am adding this to our daily schedule. I can say taht I was sore for the first few days. I have worked muscles that have not been “worked” for quite some time! But I know it is worth it. I decided not to start with anything major or hard so that I would not e discouraged and quit. I defiatly recommend starting this way. 11 weeks ago I could not imagine doing 30 minute workouts a day and walking 30 minutes a day! NO WAY! BUT since I have lost 20+ pounds I have more energy and i LOVE it! Ready for my weigh in? 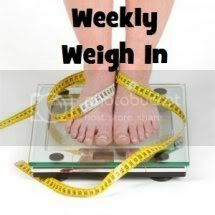 Drum Roll Please…..
2.2 pound lost this week! For a total of 24.2 pounds LOST! AND… Joel (my husband) completed week 7. How did he do? Check out his guest post here. Ready for HIS weigh in? HE LOST 2 POUNDS this week! For a total of 19 pounds lost!